We were inspired to think about natural disaster relief, recovery, and prevention after talking to IBM Watson representatives. After mulling some ideas over, we came to the realization that visualizing and contextualizing past natural disasters may be useful. Once a natural disaster hits, it is very difficult for outside parties to help due to damaged infrastructure (no Wifi, cellular signal, etc). Thus, it is in everyone's best interest to predict and be prepared for the onset of natural disasters. 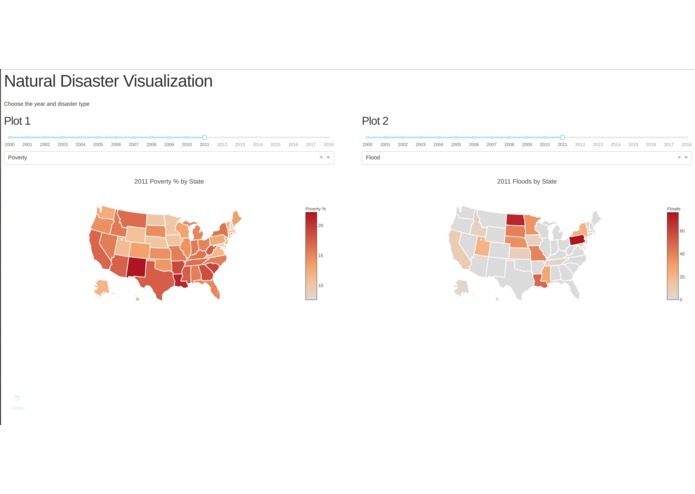 Achieving this requires understanding regional trends and characteristics, so we set out with the goal of making a comprehensive visualization dashboard in mind. Our web app allows the user to plot side-by-side choropleth heatmaps of the USA across several variables (frequency of floods, earthquakes, forest fires, hurricanes, blizzards, and poverty rate), from 2000 - 2018. It also shows the most commonly traveled to airports from each state (using Amadeus), which may give interesting insights into how human behavior is affected by natural disasters. In general, the app empowers people to make their own informed judgments given years of data, and with more data and visualizations, it will be even more empowering. We downloaded and processed data from the Federal Emergency Management Agency and US Census. We plot the aggregate number of events as a choropleth map on the state level. The web app uses Dash, a high-level Python framework that wraps Flask and enables easy use of Plotly - a popular graphical library. Finding yearly data for occurrence of natural disaster events by state was difficult. Cleaning the data, reformatting it, and setting up Dash also took a while. We found ourselves unable to make additional insights, such as relationships between natural disaster frequency and underlying infrastructural deficiencies, and/or geopolitical factors. There didn't seem to be concrete data enabling these types of extrapolations. We built this in less than 10 hours, after scrapping our initial idea. The graphs look decently aesthetic. The app could benefit from other visualizations and insights. For example, some water sources have sensors to monitor water level in real time. If coupled with rain forecasts, we could generate flood predictions. We might be able to predict forest fires by looking at real time humidity and air pollution metrics. We should also add static information (such as what to buy for each type of natural disaster, and who to call). Wrangled data into format amiable for use with plotly; experimented with amadeus API.